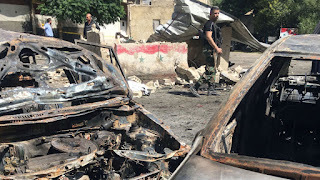 At least seven people have been killed and 13 wounded in one of three car bombs to rock the Syrian capital Damascus. The deadly explosion in Tahrir Square in the centre of the city was triggered by a suicide attacker, who had been surrounded by security forces. Footage from the scene showed roads scattered with debris, several badly damaged cars, and another one that had been turned into a pile of twisted metal. The other two car bombs were destroyed in controlled explosions at an entrance to the city, according to state media. The authorities said the number of casualties were limited because government forces prevented "the terrorists from reaching their targets". They said they had foiled a plot to strike crowded areas on the first day of work after the long Muslim holiday that follows Ramadan. The attack was the biggest in Damascus since a wave of suicide bomb blasts by jihadists in March left scores dead. Forces loyal to the regime of Bashar al Assad have been battling to drive rebels from Ain Terma, one of their last strongholds on the eastern outskirts of Damascus.